This article originally appeared in the magazine Modern Photography, December 1949. It's dated but much of the information is still useful, particularly when evaluating older enlargers. Size: will it handle the largest negative you want it to? Light distribution: is light distributed evenly over full projection are? Check visually or, better, by exposing sheet of esxtra hard paper without a negative. Lens: does it cover the largest negative you expect to use, without stopping down? Watch for unsharp corners when projecting a negative with fine detial. Lens diaphragm: is it adjustable to provide plenty of exposure latitude for dodging and other print control? Other lenses: Are lenses readily interchnagable in standard lensboards or screw mounts? Do bellows or focusing tube handle wide range of focal lengths? Focusing: is adjustment fine enough for accurage focus, yet broad enough in action to focus swiftly and surely? Can focus be locked securley while changing negatives and making other adjustments? Lamphouse: is it light-tight (for color) or reasonably so to prevent fogging of ordinary projection papers? Can lamp be left burning for long epriods without over-heating or damaging negative? Upright: is it sturdy and rigid, smoohtly finished? DOes it provide clearance on baseboard and height for big blow-ups? Controls: are they conveniently located and large enough to provide plenty of leverage for turning and locking? Do they operate smoothly? Construction: Is enlarger heavy enough to be rigid and vibrationless? Do moving parts worht freely without binding? If you lunch in the airport restaurant in Memphis, you will see a dramatic photo mural of a Mississippi stern wheeler, her fragile network of paddles festooned with tiny, glittering icicles. Enlarged from a section of 35mm negative to a print nearly six feet square, this mural is a part of the wizardry made possible by the modern photographic enlarger. Perhaps not all photographers yearn for pictures six feet square, but most of us do want reasonably big prints from our negatives. We also want the second chance an enlarger gives, a magical opportunity to correct details of lighting and composition overlooked in taking the picture. We may welcome, too, the fascinating bag of parlor tricks that goes with enlarging—the making of montages, the double-printing, diffusing, vignetting, and distorting of images as our fancy dictates. These are the motives that make nearly every serious photographer, sooner or later, own an enlarger. It may be a chrome-plated, autofocus model costing several hundreds of dollars, or a simple enlarger, stripped to essentials and selling for $20.00. Whatever the final choice, though, it usually takes a lot of consideration, for right nwo there are more than sixty different enlargers manufactured for sale in this country. To help simplify the choice for you let's discuss enlargers in terms of your own personal needs and camera problems. First, what sort of a machine is a projection printer or enlarger? It is a camera in reverse, a modern magic lantern that projects the small image of a photographic negative onto a larger surface of photographic paper. In a modern enlarger, eight principal parts accomplish the projection: (1) light source; (2) a lamp house; (3) a diffusion screen, condensing lens, or combination of both; (4) a negative carrier; (5) a lens; (6) a focusing device; (7) a mechanism for changing the distance of the lens and lamphouse from the image surface; (8) an easel or surface to hold flat the sensitized paper. Briefly, these parts function something like this—the light source either illuminates a diffusing surface that spreads the light out evenly over the negative, or illuminates a condenser-lens system that gathers the light and focuses it evenly on the negative. Light passing through the negative from this source then goes into the lens and is projected onto the easel. The farther the easel is from the lens, the bigger will be the enlargement. The enlarger you buy should match your camera more or less in quality. A box camera negative can be projected very adequately by a quite inexpensive enlarger. A negative from a fine miniature camera, on the other hand, should be enlarged in a comparable precision machine. Remember, an enlarger can project only a negative's original quality and it's useless to expect this to be improved by any enlarger. Another consideration is size. Enlargers should be purchased for approximately the size of negaives that will be used in them most often. Ideally it is best to have one enlarger for miniature work and another to handle larger negatives. Focusing adjustments on various sizes of machines differ accordingly to the lens focal lengths for which they are designed. Thus on a miniature enlarger with a two-inch lens for 35mm and Bantam negatives, the focusing mechanism would be one of fine adjustment since a short focal length lens requires very little movement to change its focus a great deal. On larger machines which might use a five or a six-inch lens to accomodate 4x5 film, the adjustment would be broader in action since longer lenses need much more adjustment to bring them into focus. Substituting a short focal length lens in a large projection printer made for longer focal length lenses increases greatly the size of enlargement possible, but makes accurate focusing more difficult. In addition, miniature enlargers accomodate full rolls of film without cutting, whereas larger machiens often require cutting roll film into small units. If only one enlarger can be purchased, naturally it should be one that will handle the largest negative to be used, since it would also be able physically to handle smaller negatives and perhaps shorter focal length lenses. Large negatives cannot be used in small enlargers unless, of course, they are actually cut down in size. In lenses, too, quality and size should approximate camera quality and size. The enlarger lens should have a focal length roughly equivalent to the longest dimension of the film to be projected. Thus a three-inch focal-length lens is ideal for enlarging 2¼x3¼-inch negatives if it provides adequate coverage. This ratio differs from camera lenses whose focal lengths should approximate the diagonal of the negative produced. In enlarging, the shortest focal length lens that will cover the negative sharply is most desirable and permits the largest "blow-ups." A lens that is too short on the camera produces an exaggerated "wide-angle" perspective. But in enlarging there is no perspective, since a flat surface, the negative, is reproduced as a flat surface, the enlargement. Nothing is to be gained by a longer focal length lens on the enlarger, unless the lens will not reproduce a sharp image to the edges of the negative. The advantage in using the shorter focal lengths appears in the shorter distance necessary between lens and easel for equal magnification. To double the linear size of a five-inch negative with a lens that focused at, say, seven inches would require a height of 14 inches from the easel. The same negative used with a 9" lens would require a height of 18 inches from the easel for the same results. In general, all projection lenses should be good quality glass capable of producing a sharp, undis-torted image on the enlarging easel. Rather than discuss the aberrations that a lens should not have, it is simpler to say the lens should be sharp and should be able to reproduce a square as a square, an oval as an oval, a pin-point as a pin-point. Let the glass-makers worry about how this is achieved. A lens also should be able to focus the flat field of the negative and reproduce it as a flat field without fuzzy edges. Simple lenses will approach these requisites much more closely if used at small apertures. It is easier for any lens to accomplish these feats of sharpness with a black and white negative than with a color transparency. For persons seriously considering color work with their enlargers, a lens must have, in addition, the ability to focus all colors in the same plane. This calls for more elements of different types of glass, which in turn make such lenses more expensive. For exceptionally fine work in special cases, process lenses of even greater quality are used in projection printing, but the average photographer will have no need for these masterpieces of lens grinding. Coated surfaces in lenses will tend to lessen internal reflection and are desirable in enlargers just as they are in camera lenses. The question will always come up concerning the use of camera lenses for enlarging. Generally speaking, the answer is "No," but with lots of qualifications. When an ordinary camera lens, even a good, well-corrected one, is used for enlarging, trouble may arise due to the fact that a camera lens is designed and corrected to give best definition for relatively distant objects. With most camera lenses, this distance is in the neighborhood of 25 to 35 feet. Also, since optical limitations make it nearly impossible to produce a lens giving a flat field at all magnifications, camera lenses are designed to render a flat image of com-paratively distant objects. When these lenses are used to make enlargements in the usual magnification range of 2X to 10X, the image field (which is the enlargement) has a slight backward curve that tends toward unsharp corners. In addition, coma, which usually is corrected to a very high degree in camera lenses focusing on distant objects, becomes apparent when a camer	a lens is used in the usual enlarging range. Still, camera lenses are, and will continue to be used to produce many, many completely satisfactory prints. To be usable, they must be easily removed from the camera by means of a lensboard or barrel mount. It would never pay, of course, to take a lens off a camera if any fine screws had to be removed in the process. Now let's look into the enlarging optical systems. The diffusion type of system (Fig. 1) is the most inexpensive and one of the most widely used light sources of all. It incorporates opal glass or ground glass to disperse the light rays evenly before they pass through the negative. A parabolic reflector is usually added to increase the directed intensity of the larger frosted bulb used in this type of enlarger. 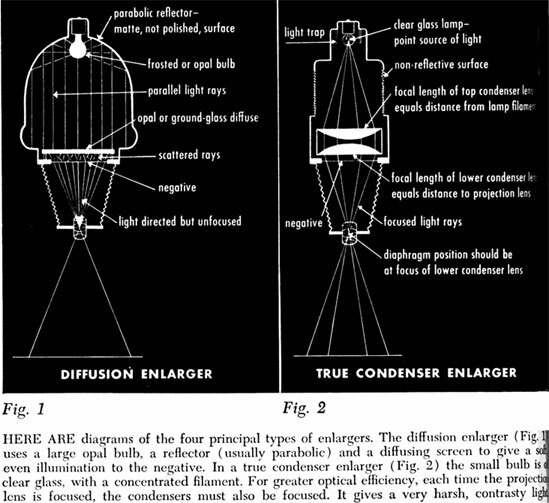 The true condenser-type of illumination (Fig. 2) uses a pin-point source of light. The first of two condenser lenses spreads the light from the lamp filament evenly upon the surface of the second condenser lens. The second lens then reforms the rays, passing them through the negative to a pin-point focus at the optical center of the projection lens. To take full advantage of this optical principle, the condenser lenses should be focused each time the enlarging lens is focused. If projection lenses are to be changed on a true condenser enlarger, different sets of condensers are needed to match each lens. Condenser lenses usually are of the plano-convex type used in pairs, mounted so that their plane surfaces face the light and the enlarger lens, while their curved surfaces face toward each other. For even light distribution over the entire negative surface, their diameters should be slightly larger than the diagonal measurement of the largest negative to be used with them. Advantages of the true condenser system are a bright image from a low-powered light source and a very even illumination of the negative. Disadvantages are the focusing problem mentioned above and the greatly increased weight which must be compensated for in construction of the lamp house and upright post of the enlarger. Cost necessarily mounts rapidly in enlargers with good condenser systems and similar machines with diffusion screens can be obtained for much less. A happy combination has been incorporated into a number of popular enlargers (Fig. 3). In this type, one condenser, usually the one nearest the negative, is ground like ground glass or lies on a circular piece of opal glass. This kind of enlarger usually uses a large frosted bulb for illumination, gets slightly less speed from the combination, and gives softer light than does the straight condenser system. 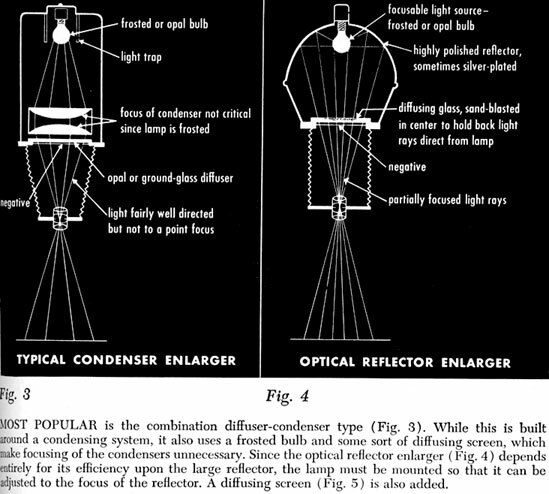 Another combination uses one or two condenser lenses, but again a large opal bulb instead of the pin-point projection lamp of the true condenser enlarger. Both of these compromise systems eliminate most of the necessity of focusing the condenser lenses each time the projection lens is focused. In each case, however, speed is lost in the form of light intensity. The true condenser system gives the most efficient, concentrated light for a given wattage. In both modified condenser-types described, additional light is provided by more powerful bulbs. True condenser enlargers give a very harsh type of light. Every line of fine detail in the negative, as well as every defect and particle of dust, is projected sharply on the sensitized paper. Contrast of the negative is greatly increased with this type of light and the same negative usually requires at least one and sometimes two grades softer of enlarging paper to produce the same contrast as in a diffusion enlarger, or a modified-condenser model. Optical systems for miniature enlargers usually tend toward the crisp condenser type to obtain maximum brilliance and contrast from tiny negatives. Enlargers for larger negatives tend more toward softer light sources because the extra sharpness inherent in a large negative doesn't need the added expense of a condenser optical system. There are many exceptions, of course, including 8xl0-inch equipment with condenser systems priced at many thousands of dollars. A fourth kind of enlarger, which gives results comparable with a well-designed enlarger of the modified-condenser type, is the optical reflector enlarger (Fig. 4). This incorporates a scientifically designed reflector which performs the function of a condenser system, focusing the light rays through the negative to the optical center of the projection lens. Its highly-polished surface reflects the light from a large frosted bulb with an intensity nearly as great as the lamp itself. Since it is optically impossible, however, to produce a perfect reflecting surface, the reflected rays don't quite approach the intensity of direct rays from the source. 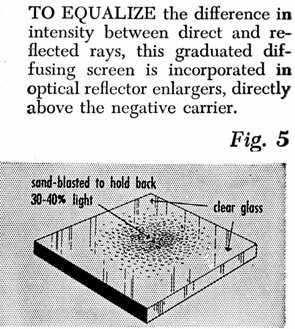 To equalize this slight variation in intensity, a thin, graduated diffusing screen (Fig. 5) is placed directly above the negative. Lamphousing changes with types of illumination, too. The condenser en-larger requires little more than a good cooling surface around its small bulb. The diffusion enlarger, on the other hand, usually incorporates a reflector and is generally somewhat larger. Also the diffusion enlarger may use the "cold light" type of illumination. This gives light of high actinic value with practically no heat. "Cold light" sources consist of an electrical discharge through mercury vapor or rare gases such as argon. The large sizes of the tubes, which cover most of the lamp-house, make even illumination easy. A less elaborate lamphouse is required since only a box is necessary to enclose the tube. Disadvantages of "cold light" are frequently a tendency to respond slowly to the turn-on switch, poor quality of light for fine color work, and varying intensity during exposure. The lamphouse required by the optical reflector enlarger is the main disadvantage of this type. It is generally heavy and cumbersome due to the size of the reflector it must contain. Directly under the condensers or diffusing glass of an enlarger is the negative carrier. This can be formed of two pieces of clear glass between which the negative is sandwiched, or can be an open-type carrier, known usually as a "dustless" carrier since it eliminates four extra dust-trapping surfaces. Glass carriers do hold negatives flatter than open types, but have a tendency to gather dirt and cause troublesome Newton's rings. The best "dustless" types of carriers consist of two pieces of metal cut out slightly smaller than the outside edge of the negative. The negative rests by its edges on the lower piece and the top frame holds it tightly. 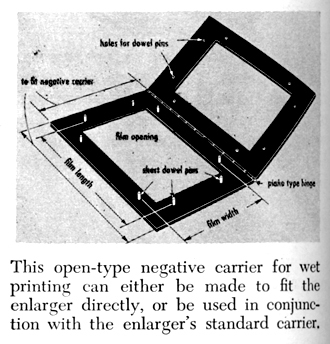 Most of the better enlargers have both types of carriers available, so that glass can be used on dry negatives and open carriers can be used for wet printing. Small negatives, such as 35mm, are much easier to hold flat by the outside edges since their center area is so small. A large negative such as an 8x10", is almost impossible to hold in this manner because the weight of such a large sheet of film causes it to sag in the center. Since occasions arise in professional work when large negatives must be enlarged wet, special carriers have been designed to grab the film firmly on two opposite sides and stretch it by tension screws. This open-type negative carrier for printing can either be made to fit the enlarger directly, or be used in conjunction with the enlarger's standard carrier. A focusing mount must work smoothly and rapidly enough to enable the operator to see when the image is sharp on the easel. Focusing mounts should be designed so that focus adjustments can be made with a minimum amount of rotation of the lens, ideally in less than one turn. Both focusing mount and bellows enlargers are built in "auto-focus" models. These enlargers automatically focus the lens by means of cams as the lamphouse is moved up and down in adjusting the size of enlargement. Two methods are used to obtain precision balance between lens and cam. The first matches the lens to the enlarger and the second system adjusts the cam to fit the lens. In the first system, standard precision cams are produced and lenses are chosen from the production line which fit into the tolerances required by the cams. Lenses that fall out of these tolerances, though the same in all other respects, are named differently and sold for manually focused enlargers, or for the type which adjusts the cam to fit the individual enlarging lens. Construction of lens-focusing devices on enlargers varies as much as it does on cameras. The obvious, of course, is the track and bellows just as on a view camera. Often used on miniature enlargers, with small lenses of short focal lengths, are focusing tube mounts having high pitch multiple threads which change focus noticeably with a partial turn of the mount. Lenses usually are provided with screw mounts for securing them in the focusing tube or in the front of the bellows. The lens can be removed by merely turning it out on its threads. Some of the better machines use a diaphragm system for "grabbing" the threads on the lens to facilitate faster changing of lenses, but this method has dangers of improper lens alignment. A third and very common type is the lensboard mounting. This simplifies the use of a camera lens mounted in the same manner. The structure of the enlarger or the upright should be sturdy and vibra-tionless and should work smoothly. Some machines use a single post upright and others an angular double track. But whatever method is used, the lamphouse should go up and down with a minimum of effort. To achieve this, most enlargers provide a counterbalance system to offset the weight of the enlarging head. Usually this is a coil of spring tape, but can be simply a weight on a pulley. Baseboards are usually heavy plywood and should be large enough to move an easel about freely without interference from the upright. Large baseboards give more support to the upright, too. Many special devices are incorporated into enlargers to add to their versatility, just as they are in cameras to make life easier for the photographer. For correction of distortion, some enlargers have a means of tilting the negative carrier so that lines can be partially straightened if the camera has not corrected the lines when taking the picture. If, for example, a small camera without a swing front were used to take a picture of a tall building by pointing up at it, the lines of the building would converge toward the picture top. By tilting the lens or negative, some of this distortion could be corrected since the enlarger would be projecting off-center. By tilting the easel in the opposite direction, more of this distortion could be eliminated. In either case, the lens diaphragm must be stopped-down to a small opening to keep sharpness over the whole negative. This kind of correction can be done only to moderate degrees and it is inadvisable to depend too much upon it. Some enlargers can be tilted horizontally for use as projectors or for making photographic murals. Most models can be rotated about their upright posts so that they can project to the floor from table height, while their easels remain clamped on the table. Much larger prints, of course, can be made with this additional distance for projection. For color work, the better enlargers have special "color heads" that accommodate tri-color filter wheels or separate filters for color separation. The rigidity of the enlarger is a very important requisite for color work. Since three separation negatives are made from a single color transparency, each must be projected from an identical position in the enlarger. To have the enlarger waver even slightly would mean a set of separations badly out of register. Color work involves projecting upon sensitive films which would be fogged or degraded by stray light, so the lamphouse must be as light-tight as possible and must not let stray beams bounce around the darkroom. Lenses must be fully color corrected to prevent color fringes being formed. Some enlargers have attachments which turn them into copy cameras. Usually this unit consists of a camera back to hold film holders which replaces the lamphouse and includes a ground glass for focusing. With the multitude of good enlarging equipment available at present, you should have little difficulty finding the right machine to match your camera and your pocketbook. You will learn a good deal about enlargers in your search, and much more about picture making after you've found one. And when you begin to explore the many exciting possibilities your enlarger offers, you'll know some of the real satisfaction of photography.